Note: The pantry is located at 7 Chicago St (north side of Chicago on Franklin, between Chicago and Erie). This is the Asbury Center of First United Methodist Church. Thus, the attached map is erroneous. Your opinion matters. Leave A Review Or Edit This Listing for Christian Food Pantry. Food donations can be dropped at any of the sponsoring churches during normal business hours. (First Methodist, First Presbyterian, Trinity Lutheran, First Christian Churches) First Christian Church's office are open M-F from 9 am to 3 pm. All the basics are needed, Pork 'n Beasn, tuna, juices and canned pasta. Coffee in small cans is requested along with dish soap and laundry detergent. Staples are needed. Canned meats (tuna), canned vegetables, canned beans, canned soups. Please donate items that you would eat. Loaves of bread are always appreciated. Small size toiletries, like you get at motels are always appreciated. Here are some 'extra' items that would be of help to supplement the regular foods that are given. In 1982, the Food Pantry at First Christian Church was begun as a way to serve the needs of some of its own families. That first year, the Christian Food Pantry served an average of 89 families each month. With the expansion of the food pantry's mission to serve the community, four neighboring churches "First Presbyterian, First United Methodist, St. Andrew's Episcopal, and Trinity Lutheran "joined in the effort to provide this service with donations and volunteers. The 1984 annual report showed a 38% increase in demand from 1983. (from Celebrating our Story', Give to ... God the things that are God's. (Matthew 22:21) - History of the First Christian Church (Disciples of Christ), Valparaiso, Indiana; First Christian Church, Valparaiso, Indiana; 2012). We always need more information on our pantries. 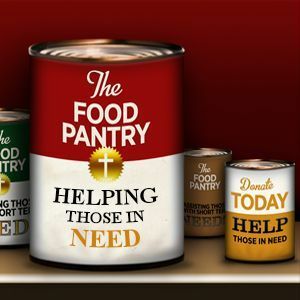 If you know of any details, volunteer information, website, hours or more description information about Christian Food Pantry please add a comment (below the map on this page), with information. We will then display this for all visitors on this page.